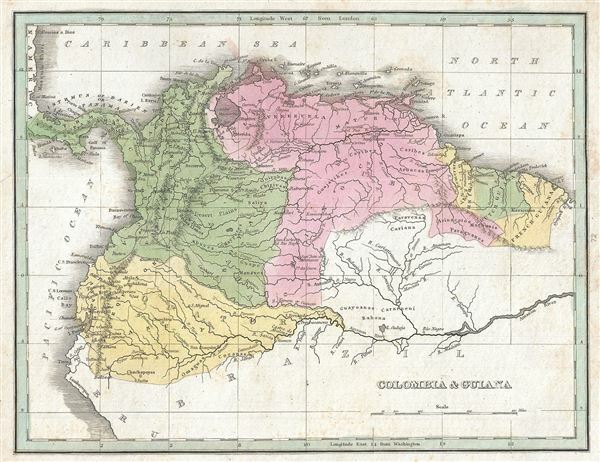 This is an excellent example of T. G. Bradford's 1835 map of Colombia (New Granada), Venezuela, Ecuador and Guyana. This map covers French Dutch and British Guiana as well as Gran Colombia or Great Colombia, which included territories of modern day Colombia, Venezuela, Ecuador, Panama, and part of northern Brazil, Peru and Guyana. Bradford's map offers fine detail throughout with elevation rendered by hachure and political and regional territories color coded. Towns, rivers, mountains and various other important topographical details are noted. Envisioning an independent New World nation comprising all of the territories under the Spanish and Portuguese colonial rule, the Venezuelan revolutionary Francisco de Miranda suggested a consolidated South American empire named after Christopher Columbus. The idea took hold and in 1819 the 'Viceroyalty of New Granada' (comprising of modern day Colombia, Ecuador, Panama, and Venezuela), among the first South American regions to liberate themselves from Spain, was renamed 'Gran Colombia.' The war against Spain finally ended in the mid-1820s when the pro-Spanish loyalists were decisively crushed. The congress of Cucuta adopted a constitution for the new republic in 1821. The vision of Gran Columbia, unfortunately, proved untenable and Venezuela and Ecuador became independent states 1829 and 1830, respectively. This map was published as plate no. 72 in Thomas G. Bradford's 1835 Comprehensive Atlas Geographical, Historical and Commercial. Bradford's atlas, published in 1835 was an important work on many levels. First, it was one of the first American atlases to follow an encyclopedic format, offering readers extensive geographical and statistical tables to supplement the maps themselves. Second, it was published in Boston and influenced the city's rise as a publishing center later in the 19th century (at the time most publishing in the United States was restricted to New York and Philadelphia). Third, this atlas was the first to contain a separate and specific map showing the Republic of Texas. Fourth and finally, Bradford's atlas in some instances broke the Euro-centric mold regarding atlas production. Among other things, Bradford focused his atlas on the Americas and abandoned the classical decoration common in European atlases in favor of a more informational and inherently American approach.